It's a basic tenet of safe paddling: Bring what you need to fix whatever goes wrong with your boat or your body, and know how to use it. Boat repair and first aid kits are permanent fixtures in our day hatches--essentials we're happy to have and hope not to use. 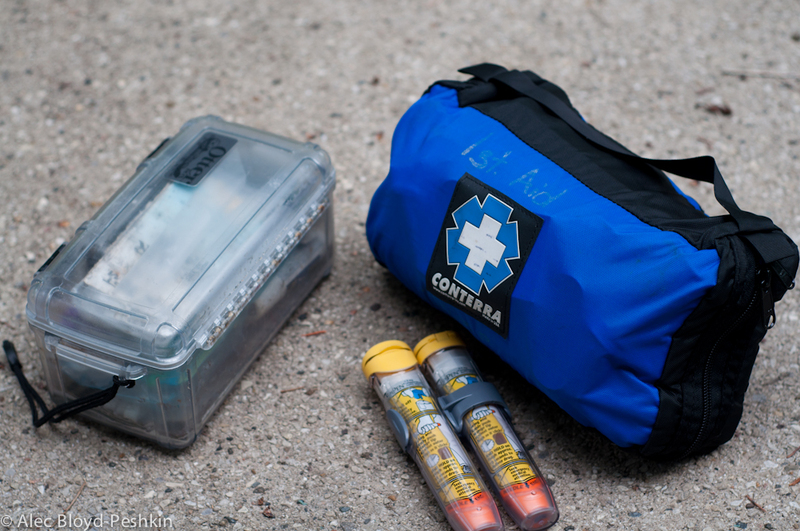 Our compact boat repair ( in waterproof Pelican box) and first aid kits. inhalers (in case of asthma). 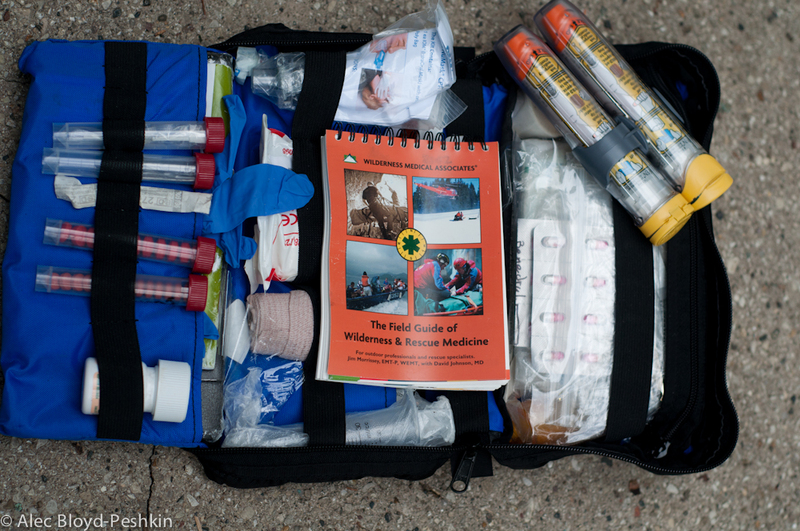 Our first aid kit with additions; we stored it in a dry bag. Wilderness Medical Associates offers a helpful guide to assembling a wilderness first aid kit. We suggesting buying a basic first aid kit and modifying it for your needs. In the end, you have to make choices about what and how much to bring. We also restocked our repair kits with additional materials for fixing leaks, holes, lost hatch covers and jammed skegs. Here, too, we made choices and left a spare skeg cable at home. We used the first aid kit twice (not including regular provision of ibuprofen--or "vitamin i," as it's commonly known). 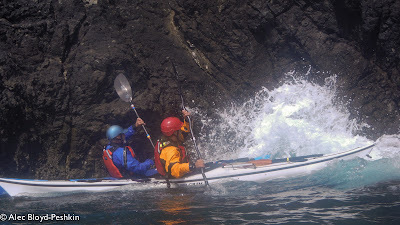 Both incidents happened on land, which isn't surprising when you compare the risks during paddling (mostly repetitive stress injuries, which are unlikely if you have good technique, but possibly injuries caused by impact during a rescue) with the risks while carrying heavy boats, climbing on rocks, using knives and fire to prepare meals, and walking around in the dark. Sharon sustained the first injury during lunch about a week into the trip. Perched on a rock, holding her rescue knife (with which she had just sliced cheese--one of its main uses), she reached for a falling water bottle and cut deeply into one of her fingers. It bled profusely, which was great for ensuring it was clean, but it required bandaging to stay closed and heal without infection. We were happy to have antibiotic cream, waterproof bandages and nitrile gloves to protect it (not to mention Alec, who has both Wilderness First Responder and EMT certifications). For several days afterwards, Sharon was our "super villain," complete with lavender glove. Sharon protecting her bandageded finger from infection (and pretending she lost half of it). Photo courtesy of John Fleming. Keith sustained the second injury on the final night of the trip. Walking in the dark on the beach, he kicked a log and split open one of his toes. Alec used a syringe to thoroughly clean the wound, and then antibiotic cream, gauze and vet tape to protect it. 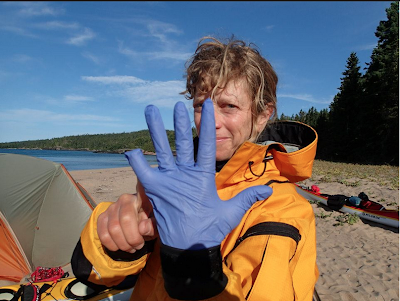 For these two injuries, we had everything we needed, but we realized we should also have had an anti-fungal cream because of the potential for fungal infections from all the time we spent in wet neoprene gear. Our boat repair kit partially unpacked. 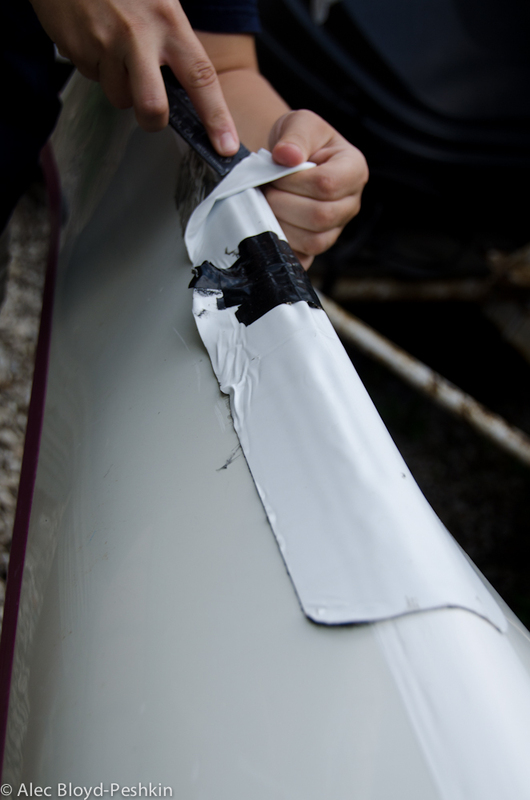 Removing the repair tape after returning home. It successfully kept water from entering a chipped skeg box. We also had one boat modification; we used the tape to attach two pieces of foam to Sharon's seat to relieve pressure on her tailbone. 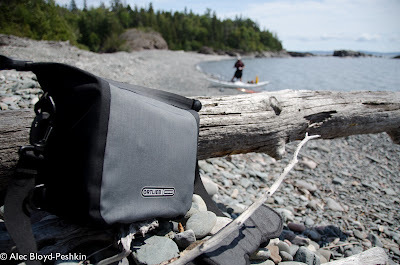 (Sharon was paddling a NDK Pilgrim, since her Avocet LV doesn't have sufficient storage capacity for longer trips.) 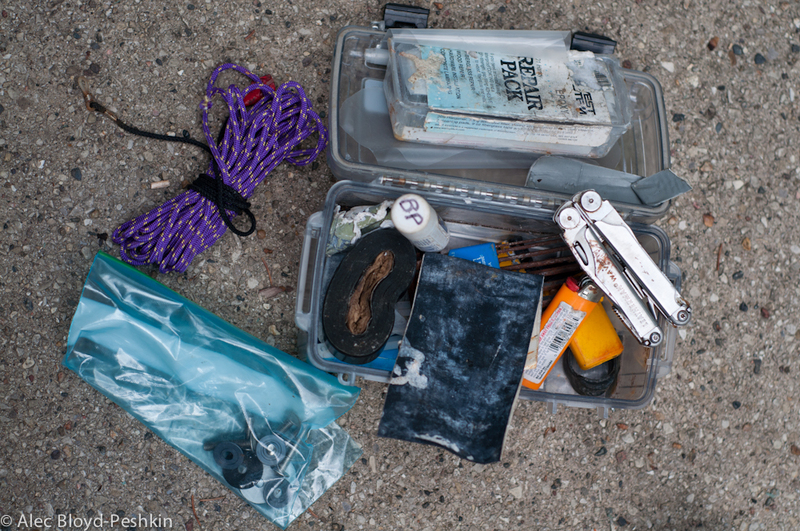 We didn't actually have foam in our boat repair kit, but we had some in a camera bag. Materials that can serve two purposes are especially handy when you're trying to minimize weight and volume. These incidents reinforce the importance of checking and reassessing your boat repair and first aid kits. They should include everything you might need, and you should know when and how to use everything they contain. They should also be kept in an accessible location -- we keep them in our day hatches -- and be in waterproof containers. The seat issue was also a reminder that it's not a great idea to change anything significant before a long trip. Sharon had not paddled the Pilgrim for several long days in a row, so the seat issue didn't arise before the trip. Fortunately, we had foam and were able to successfully modify it. Finally, the medical incidents highlight the importance of caution on land, not just on the water, especially when you're in a remote place where help is not available, because ultimately, prevention is better than a cure. 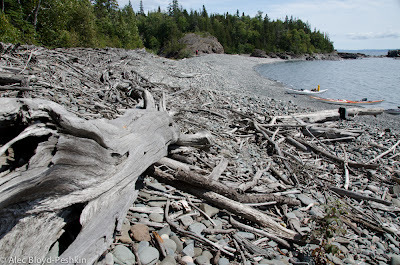 A typical beautiful and slippery cobble beach in Pukaskwa National Park. 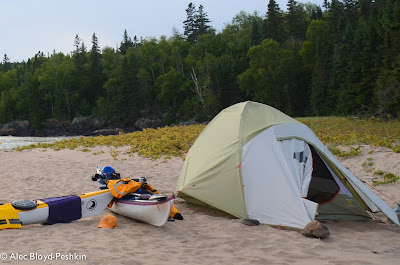 Our recent trip along the coasts of Pukaskwa National Park and the Lake Superior Highlands was a great opportunity to test a variety of gear. 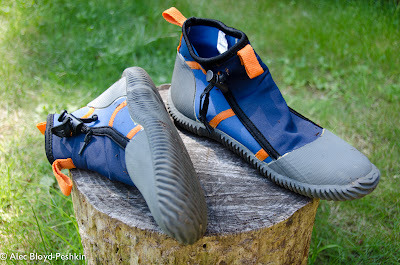 In addition to our ongoing quest for a paddling shoe that fits, protects and lasts--the holy grail of kayaking, we're convinced--we've been assessing the performance of clothing, camping equipment, camera bags and other accessories. On a wilderness trip, every piece of gear has to justify its weight and space in the hatches. 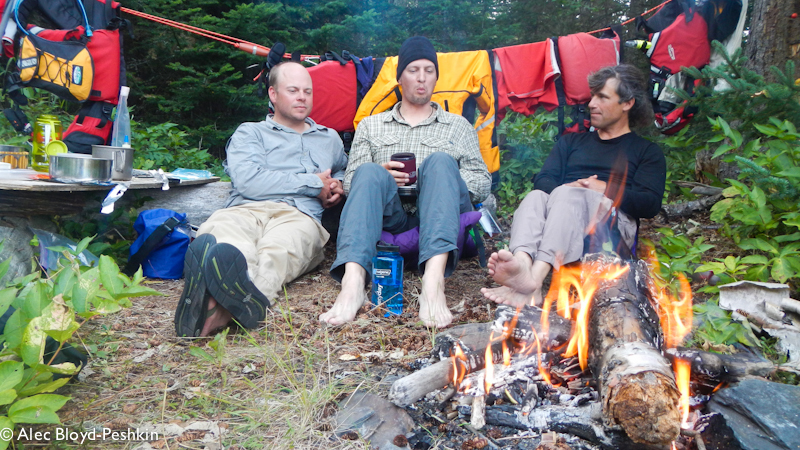 We put our gear to the test over the course of a 120-mile wilderness trip. Here's what we concluded. 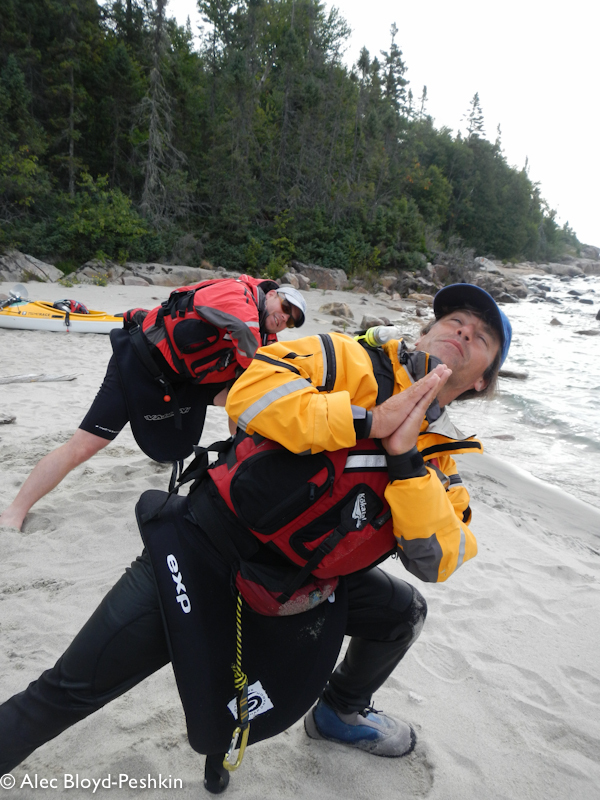 Morning yoga--or something like it--in paddling gear. 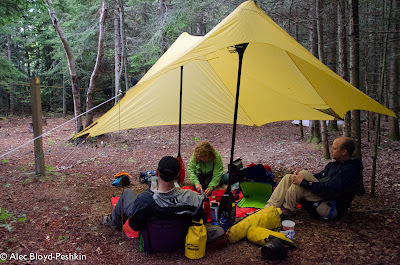 The MSR Twing, erected with paddles. Our Mountain Hardware LightWedge 2 tent on a particularly windy day, secured with rocks and boats. Luxury: The Crazy Creek Hex 2.0 Chair. 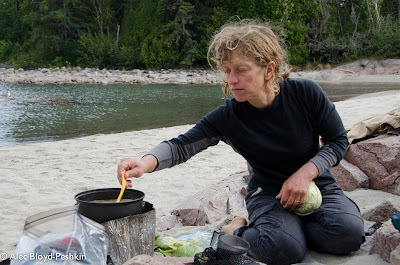 Sharon prepares a meal on the MSR Dragonfly. 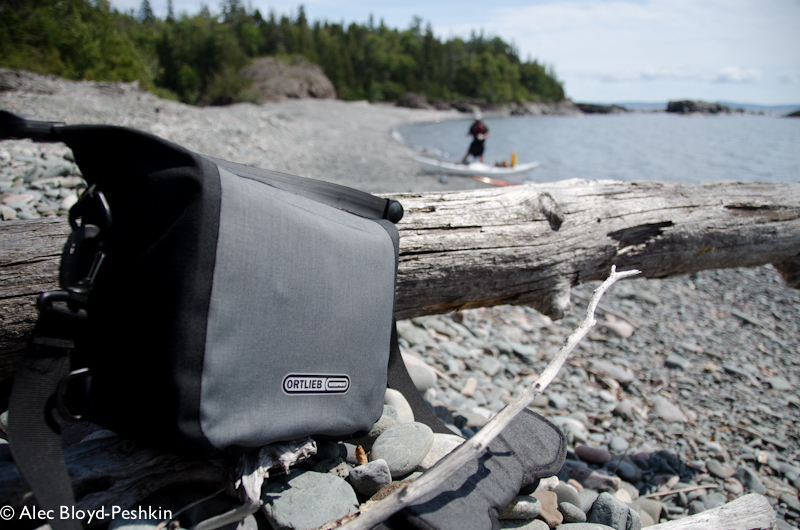 The Ortleib Aqua Cam bag. Alec naps on a rock, protected by his cag. Well, yeah, because it's there, but there's so much more to it than that. 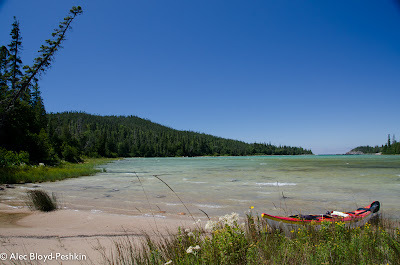 And yeah, because our good friend Keith Wikle suggested we paddle it together with him and John Fleming, but that isn't the whole story, either. 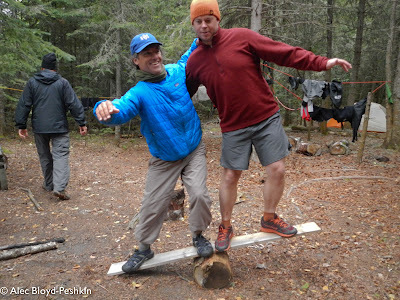 Alec and Keith strike a balance. 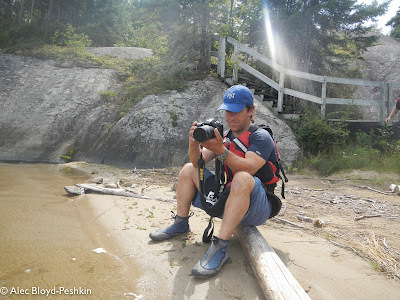 We chose to paddle the coastline of Pukaskwa National Park and the Lake Superior Highlands in Ontario because it provides a glimpse of what the Great Lakes were like before industry and development altered them irrevocably. It's truly remote: one road at Hattie Cove, another one at Michipicoten Harbor 120 miles later, and between them nothing but wilderness and pristine waters. This coastline requires complete self-sufficiency. 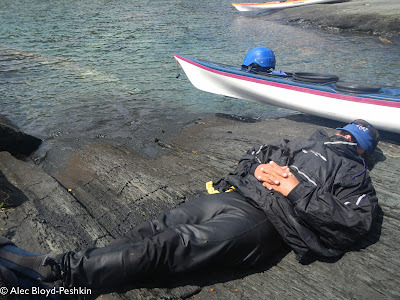 Paddlers must bring everything they need and be able to solve problems that arise without assistance from others, because they are unlikely to find anyone else around. 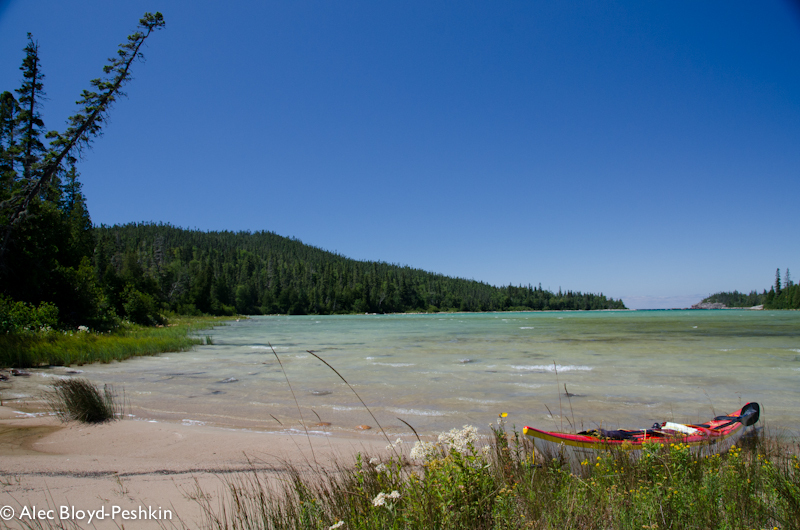 This shoreline is so remote, you're unlikely to see another paddler for days at a stretch. A trip like this requires significant planning and preparation. That's part of the attraction. You have to make a raft of good choices about everything from what boat you'll paddle to what food you'll bring, as well as how you'll handle anything that goes wrong with equipment, the weather or the health of the group. Keith and Sharon on a windy day. Expectations: distance per day, daily schedule, priorities. Logistics: shuttle, float plan, back country permits. Gear: from first aid and boat repair kits to stoves, water filters and bear bags. Emergencies: medical issues, medications, emergency contacts, extraction plan. Group sharing: medical conditions, phobias and insecurities (bears, snakes, hunger, baldness). Resources: maps, books, campsite info. Then we met in person to go over the list, discuss some of the items on it and ensure that we shared the key expectation for the trip: that it would be a somewhat leisurely exploration of the coastline, not a race to complete the mileage, and would include plenty of time for taking photos, poking into crevices, hiking to waterfalls and drinking whiskey around a campfire. Keith, John and Alec chill out around a campfire (one of our priorities). Individually, we spent time assembling our gear. 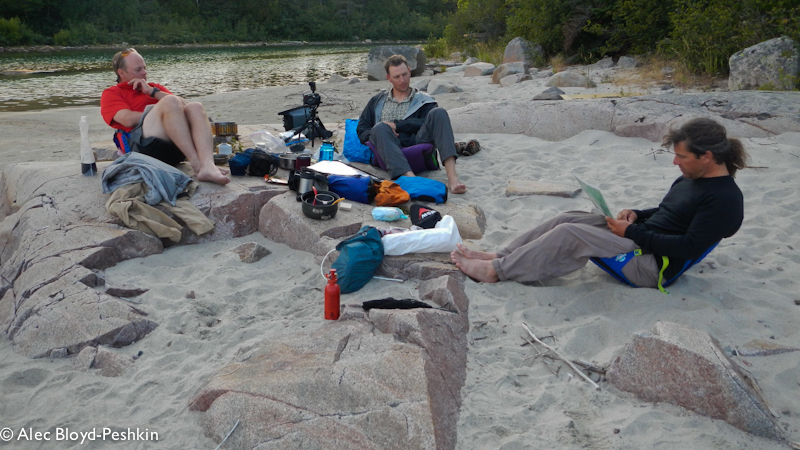 We bought and dried food, marked and laminated maps, checked our boat repair and first aid kits, assembled camping equipment, and verified that we could fit all of it in our boats. Until the last minute, we were calling and texting each other with questions and suggestions; the trip was a group effort long before we got on the water together. Ultimately, that's one of the main reasons why we chose to do this trip. 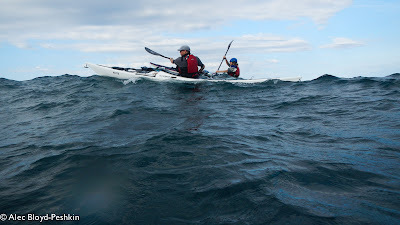 Paddling requires a considerable amount of individual knowledge, judgment and skill; paddling in a remote place requires a level of self-sufficiency that puts all of these to the test; Pukaskwa offers the potential for big seas and bad weather along with stunning scenery and solitude; paddling with others adds a level of complexity. 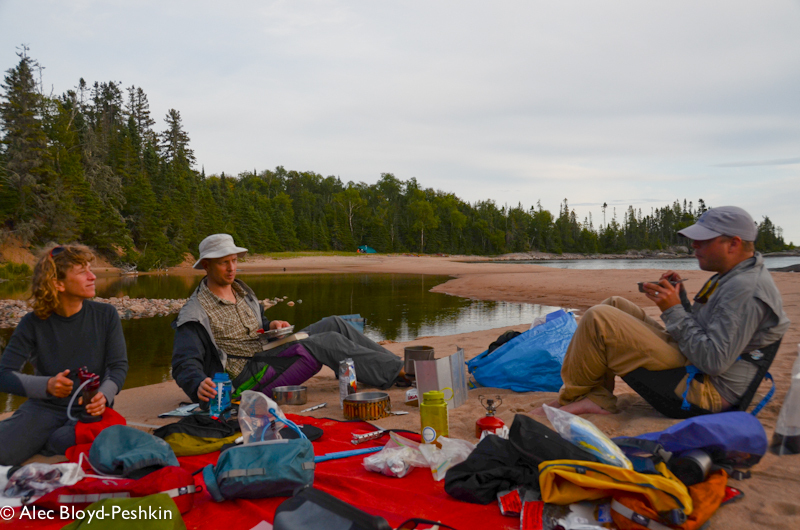 The process of planning and executing a wilderness trip with friends challenges and builds leadership and group awareness skills, and rewards that effort with the pleasure of sharing the experience on the water. Paddling Pukaskwa together was a culmination of all our effort to become good paddlers, good leaders and good friends. Doing so successfully validated all three and was a tremendous amount of fun. 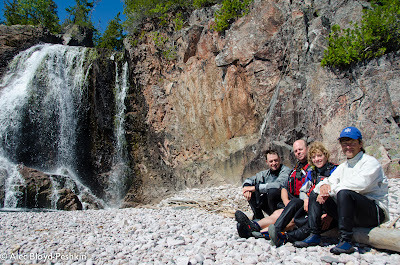 The four of us at Cascade Falls. Sharon interpreting daily marine forecasts during a wilderness trip. This has been an unusual summer for us. Ordinarily, we spend much of the season coaching locally and at symposia around the midwest. But this year, we opted to expand our horizons, literally and figuratively. 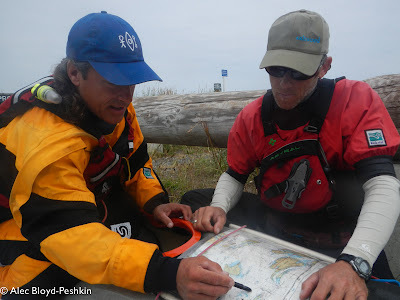 Alec and Matt chart a course in the San Juan islands. We spent most of July in the San Juan islands, paddling in dynamic ocean currents and coaching for Body Boat Blade International; we spent the first two weeks of August on a wilderness trip along the northeast shore of Lake Superior. 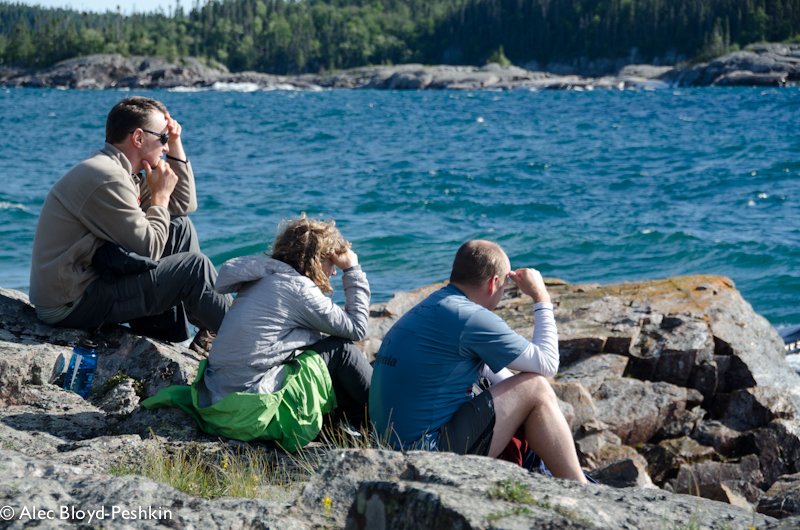 John, Sharon and Keith assess conditions on Lake Superior. 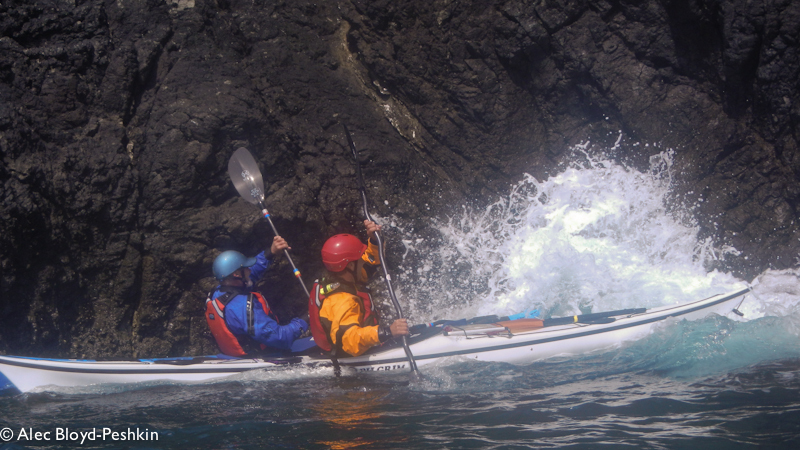 Paddling with a variety of people in a variety of environments is a great way to gain both knowledge and experience. Coaching with a variety of people in a variety of environments is a great way to challenge our creativity and develop new approaches. Personal paddling complements coaching. It puts everything we teach into practice and reminds us of our goal for our students: enabling them to safely paddle independently. And besides, we've been longing to do more kayaking on the ocean and with friends! Leon and Alec play in a slot in the rocks. 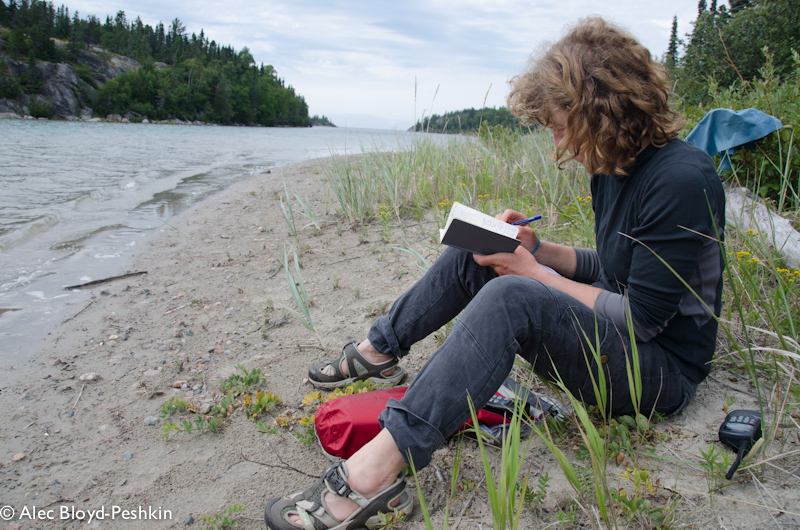 We'll devote the next few posts to reflecting on some of what we learned this summer--ideas that have affected our coaching, our paddling, our trip planning or our perspective.